this one is going to be a hard review to write without seeming to be a gripe. o.k the aparments was on the small size for a family of four. regaurdless of your party size the living area is the same size. they do not accomadate or take into account of this. the stairs leading up to the bedrooms are steep and very "iffy" with younger children so be very carefull. the bedrooms are of an reasonable size and storeage is good. beeding and sheets and pillows stink to high heaven. bathroom is quite small. and problems with shower heads moving by them selfs cause flooding. and strong smell of urine all the time. ants in every room, although you do get issued with a tin of ant killer to spray around the rooms. we had to change aprtments due to our power going off this took 24 hours before they moved us. the grounds around the apartment was in great order (better then the aprtments i may add.) the pools was clean and fresh. the staff was somewhat stiff lipped and not intrested. the food (only ate once) was catered around our German friends. the bar was very exspensive (4 euros for a local pint of beer)entertianment was naff, we watied for over two hours one night for the mini disco for the kids. this didn't happen they left the spanish football on instead for the bar staff!!!! location to the rundown faro 2 shopping center is only 10 minutes walk away. half the shops have closed down, and what is open has upped the prices since last year greatly by going what our rep has stated. Well we liked it so much in June of this year that we did in fact have that second trip we promised ourselves to Green Golf. This time we came for two weeks and the holiday was every bit as good as when we came for our first visit to the complex earlier in the summer. Once again we e mailed the complex and requested a bungalow on the golf course side and again we were not dissapointed as we actually got the bungalow next door to the one we stayed at in June! Again we can't fault the place, the internal decoration and fittings were again all but perfect, the only fault being the toaster that was replaced on the second afternoon as we had found it wasn't working at breakfast that morning. Again we were never left behind on the beach bus in the morning, in fact the bus was never more than a quarter full when it got to Green Golf, just as it had never been on our June holiday. Incidentally the Green Golf complex make no claims that the bus to Playa De Inglis stops at the beach, if you ask them in reception they tell you quite clearly (and on the leaflet) that it services the Yumbo Centre in the town. So our second visit was every bit as enjoyable as our first, the only thing we will say is that drink prices in both the Yumbo and the Cita centres have gone up about 10-15% since June of this year, we also paid far more for milk, cheese and bread than we did just three months previously....so the credit crunch is hitting the Canaries pretty hard. One last thing, many of the bungalows at Green Golf (about 25%) are privately owned and they happen to be the onew around near the golf course, it's not that the complex is favouring the Germans, it's just that many Germans own those units. Sent 3 or 4 emails to the Green Golf starting in May and finally 3 days before we left, they had ample time to allocate us a room that we requested, i named roughly 30 room numbers, the majority were poolside but a few were at the rear on the golf course side. Where did they put us(plus every other British guest) on the side facing the main road, with the clanking storm grids...all the best rooms were allocated to the Germans and Dutch. I honestly thought i was imagining this for the first week, but it was totally true. apologies for the gripe, but that was my first impression of the place. the pool area was great, spent the second week there because The free bus service to the beach was a joke, when the bus turned up it was half full from another complex, then there was a total scramble to get the last few remaining seats leaving behind some very sad faces on the bus stop. We used the service once to maspalomas beach, then caught taxis(4 euro). we also thought the bus went to Playa Del Ingles beach but after a 15 minute ride it simply stops and you all have to get off...the bus only goes as far as the Yumbo centre??????? what was that all about? there were options to upgrade yourself to a half board basis with what smelt like great grub in the restaurant for 12.50 euro for evening meal and something like 7.50 euros for breakfast. nice size room upstairs and downstairs with nice patio area and balcony, beds were okay, shower was abysmyl, useless angle that kept flopping back to face the rear wall, when it faced yourself it flooded the whole bathroom, when we reported this, it was to shrugged shoulders and a report that the company that done their recent refurb' messed up the showers so a large majority of them always flooded the bathroom when they were used(this would explain the smell on the towels, that you have to use like sandbags to shore up the door way). I know this sounds like a bad review but the complex itself was really nice, the rooms were nice, it's just our loacation and shower were rubbish. The green golf is miles out of the way, great for walks in the evening into Playa Del Ingles, and a taxi was only 4 euros down to the restaurants on the beach. ps. we did request a switch in rooms on the first day, which they gave us on the 8th day after arrival, but couldn't be bothered to pack everything so stayed where we were for the rest of the fortnight. What can I say?, totally satisfied with our week at Cordial Green Golf and not a single complaint to make. The first evening we arrived the receptionist rang our bungalow about an hour after we had taken over the unit and asked if everything was fine and to our taste. We commented that the bathroom light switch was a little dodgy with a wire hanging out and within 10 minutes (at Nine O' clock at night) the maintenance man arrived with toolbox and rectified the problem in a matter of minutes. He also took away a picture in the bedroom that had the glass cracked as we were worried it might fall out of the frame and the very next day when we returned from the beach it had been replaced. Now that is what I call damn good service! We had asked via e mail to have a bungalow alongside the golf course and away from the pool and that was sorted for us, all in all as regards the bungalow we can have no complaints whatsoever, nice and clean and well maintained with the cleaners changing our towels five out of the seven days we were there. Next time though taking our own pillows stuffed inside our cases as the three we were given were wafer thin!, but that was the only downside for us. Never saw a single cockroach, the place was peaceful without being too quiet, and the complex had a good feel about it. The kitchen was perfectly adequate and we managed to cook three really nice meals with the facilities in our week. Ok so the bar was a bit pricey and not that clever, but with the Faro just down the road there were plenty of alternatives with lots of bars and eateries in the centre. And you really must try the little German bakery in the Faro, only open from 8am till 11.30am as she sells out by then, but her croissants and pastries are to die for! The free bus service was just perfect, they use a 30 year old Scania Coach but what the heck, it was free and never once let us down. And not once did we fail to get on the bus back to the complex, and even if you do the cab fare is less than 4 euros from the beach. Would we go back to Green Golf?......Try stopping us, already trying to book up again for a two week holiday later in the year. Bungalows were very clean and still looked 'new' - had everything we needed, although we didnt cook much as we were half board. Didnt have air conditioning, but had ceiling fans, which were adequate for March, not sure how it would be at the height of summer though! The food was good, if a bit repetative, and my 4 year old struggled a bit as there was no seperate kids buffet, but he managed. Location - we felt it was a bit out of the way, although taxis were fairly cheap - there was a free bus to the beach which was very busy (we always got a taxi back from beach = 4.50 euros. The staff were very good, and seemed to love children - m son loved the attention! They work hard for their money from early morning until late at night and still smile and joke with you - we left them a decent tip! The entertainment was pretty poor - there was a hotel run kids club, and the woman who runs it realy tries her best, but maybe it was because it was March at there werent a lot of kids as it was closed most days, and as for the evening entertainment - the mini disco was a non event and one night we waited on the parrot show, which was cancelled because of sick parrots (my husband and I were relieved but my 4 year old was gutted!) and the next night the fashion show was cancelled as the models didnt turn up - that says it all really about the entertainment! So we went to Faro 2 shopping cnetre most night (has lots for kids to do there too)- take a torch as its a bit of a dark walk to it! The pool area was immaculate and the kids pool was quite warm - ideal! Would we go back to this hotel - yes! Stayed here for a week and didn't want to leave to be honest, very relaxing place to be . the apartments very clean and bright and cleaned everyday apart from monday. did not stay there for entertainment we went out to the various centres everynight as there is so much to see and do . but from what i heard alot were spanish so aimed at them. It was only a few minutes from each centre so only a few euros to get to them . and Faro 2 was a few minutes walk away. Would i go back answer Yes . looking to book as soon as. This was our first visit to these apartments and I was very impressed. They had obviously been recently done up and were very nicely decorated. The bedroom upstairs & the kitchen living area both had large ceiling fans. You could easily walk to Faro 2 in 5 to 10 minutes and taxis could be requested at reception to take you to Play Del Inglis or Meloneras promenade you could also walk to Meloneras which takes about 30 Min's. Never stayed at the apartments in the evening - although various entertainment was advertised at reception each evening. You could get a nice lunch at the bar - sandwiches/burgers. The on site shop had everything you would need or you could walk to the larger supermarket at Faro 2. Plan to visit again later in the year. We visit Maspalomas every year around September or October time. We have stayed at the Green Golf 5 times now, and will continue to stay there. The location is great, right next door to the golf course, 5 minute walk from Faro 2 and about 25 minute walk to the beach or Melonares. Taxis are very cheap into Playa De Ingles (the reception will order you one), alternately the bus stop is just around the corner and they get you all over Gran Canaria at a very cheap rate. The Green Golf runs a free bus down to the beach and into Playa De Ingles during the day. The apartments have just been refurbished and are so much better that before. (they needed it!) You have all the cooking facilities you need, including kettle and toaster. There is a TV, but you have to hire the use of it, its not worth it for English speaking as there are only the news channels. (why do you want TV on holiday anyway?!) With the refurbishments, some apartments only have showers, but others have a bath with shower attached, you can request which you want prior to your stay. (email them direct). Each apartment has its own private little garden (It is very little) and a balcony with table and chairs. There are two pools, one heated and one unheated, both are big and cleaned 4 - 5 times a week. There are plenty of sun loungers on the complex and shade is available in certain parts, particulary in the gardens. We always have an apartment near the unheated pool, as there are not so many children up that end. I must add there are no life guards. The shop has everything that you could need, but it is a bit more expensive than the one in Faro 2. We always have a walk over there for our main shop, plus there is a bakers in Faro 2. The restaurant on the complex is very reasonable and serves nice food, there is also a bar. We have only stayed in for the entertainment once, it is mainly aimed for families with kids. There is also entertainment and activities during the day, again for kids mainly. I have always found the staff to be very friendly and accomodating. If you ask for something they do it straight away. Hopefully this will assist anyone who is contemplating going. We recommend to all our friends, many of whom have been and felt the same as us. HIGHLY RECOMMENDED. May see you there! I stayed here with my friend back in july 2004 for 10 days and it was fantastic. Then in April 2005 me, the same friend, my boyfriend, my brother and my mum all went back to these apartments, we were given 2 rooms next door to each other as this was very handy for me. The rooms are very nice and they are of a really nice size, i also like the whole upstairs downstairs too, the maids came in 6 days that week and they change and make the beds and they change the towles for you too. 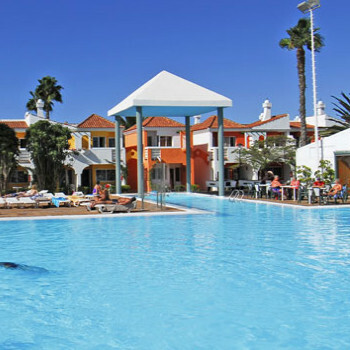 The pool area is lovely, the pool its self is massive and there is plenty of room even for the popular months, there was plenty of sunbeds to go round so no need for that early moring wake up to catch a sunbed. The pool restaurant was very nice and the food was lovley. The Faro 2 centre is about a 5-10 minute walk from these apartments, or you could just get in a taxi for 2 euro's. For a evening out then i suggest you travel into Playa Del Ingles, there is a bar called Big Bens which is by the hotel Jardin Del Sol and the staff there are fantastic would really reccomend it, or you could head to the Kasbar where there is a load of differnt bars to choose from. I would stay in these apartments again.